In Contacts, choose File > New Group to create an empty group into which you can collect your card recipients. Name the group Holiday Cards. To add addresses to the newly created Holiday Cards group, click All Contacts to see your full collection of contacts, and then drag your recipients from the center column to the Holiday Cards group. Please note; you have to click and hold briefly before Contacts lets you start dragging a contact; if you drag too soon, Contacts assumes you want to select more contacts. You can drag contacts one at a time or use the command key to make multiple selections and drag the entire selected group. By adding to a group this doesn’t move contacts out of All Contacts—you’re just adding them to the Holiday Cards group. 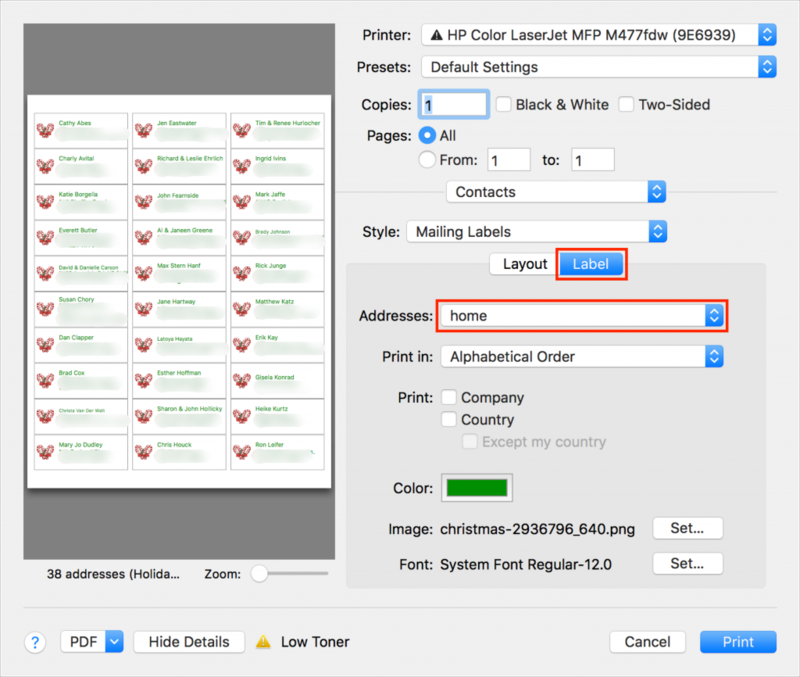 Once the Holiday Cards group is populated with all your recipients, click its name in the sidebar, and then choose File > Print. This will open the Print dialog box. To set up your cards for print, you will need to see details in the Print dialog box, so at the bottom of the Print window, click the Show Details button (if it’s already showing all the details you will see the Hide Details button at the bottom left corner and you’re all set). You also need to see the special controls for Contacts, so make sure Contacts is chosen from the pop-up menu underneath the page range fields. Then from the Style pop-up menu, select Mailing Labels. (Please see examples highlighted in red below). Beneath the Style pop-up menu, make sure Layout Button is selected, and then in the Layout view, from the Page pop-up menus, choose the manufacturer of your labels and the number associated with the labels. (Avery 5160 is the most common label type and is readily available at office supply stores and online). You will be able to find the Avery label number located on the front of the label box. Be sure you match the Avery label number (in the pop-up menu) with the number on the front of the Avery label box. Directly to the right of the Layout Button, click on the Label Button to switch to the Label view. From the Addresses pop-up menu, choose the type of address you’re using. Home is likely the most appropriate; if you choose All, Contacts will print both Home and Work addresses if available. You can also choose to print company and country here, and if you print country, you can exclude your own country, which makes it easy to include overseas friends and relatives without printing the country for most people. (Please see examples highlighted in red below). If you feel like getting a little creative, under the Table Button you can change the font style, print color or select a small image to print next to each contact. Keep in mind, defaults work best and sometimes can be the easiest route to achieve your end goal. To add an image or change the font locate the Image select and Font select buttons in the bottom of the Label Dialog Box. Select “Set” and choose what you desire. 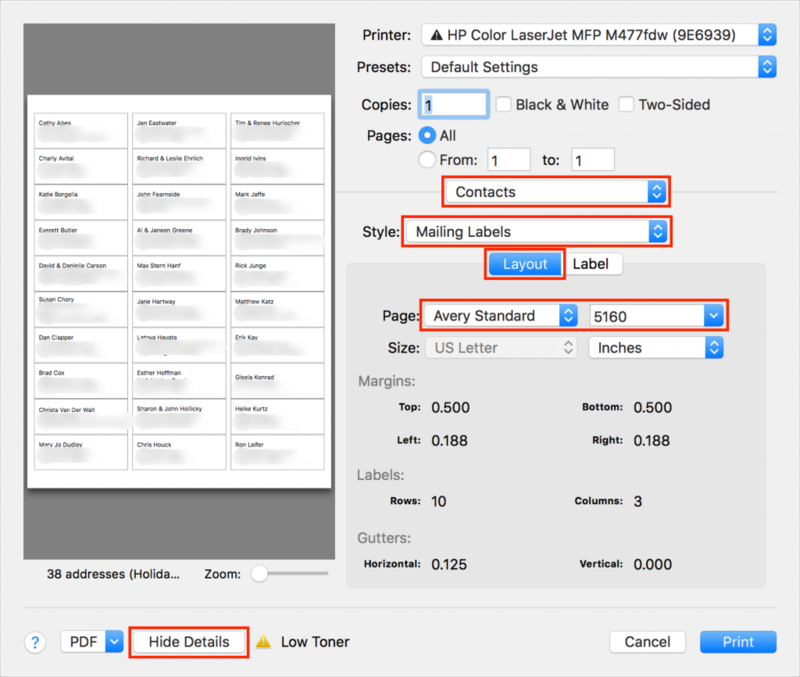 Once you have set all your settings in the Print Dialog Box, it’s time to print. But not on your label stock just yet, you will always want to run a test print on plain paper first! Click the Print button to print a draft of your labels on plain paper. You’ll use this draft for two things—checking the addresses for accuracy and verifying that the labels will print properly on the label stock. To check if the labels will print correctly, stack a page from the draft on top of a sheet of blank labels, and then hold them up to a bright light or sunlit window. You should be able to see whether the positioning is right—it should be in most cases. If not, make sure you’ve chosen the right label in the Print Dialog Box. Once you’ve fixed addresses for everyone who has moved recently and verified your positioning, you can commit to printing on your label stock. That’s it! Most of the work comes in selecting people, making sure their addresses are right, and updating those that have changed—actually printing labels takes only a few minutes. If you have any additional questions or need help creating the labels, please feel free to stop by our shop any time Monday through Friday from 9AM to 6PM. From all of us at Basics-n-Beyond we wish you all the best this Holiday Season.